Mya Renee Migneault, a 4-year-old black girl, died Friday, March 21, after she suffered blunt force abdominal trauma in the 500 block of South Westlake Avenue in Westlake, according to Los Angeles County coroner’s records. After Mya became unresponsive, her babysitter took her to a hospital on a bus. 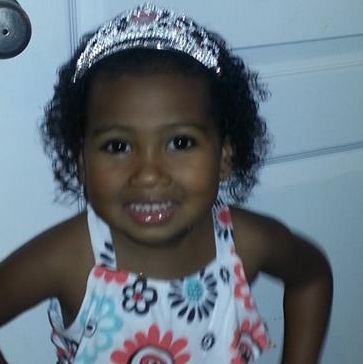 Mya was pronounced dead at a hospital at 8:03 p.m., according to coroner's records. An autopsy showed that Mya died of blunt abdominal trauma, according to coroner’s records. The girl's babysitter, Vanessa Denise Hawkins Scott, a 53-year-old black woman, has been charged with murder, assault on a child causing death, and child abuse, according to the Los Angeles County district attorney's office. Mya's mother was out of state during the incident, and had "no hand in this," said police Lt. Craig Herron. According to relatives, the girl's mother was with her fiance in the South when she got news about her daughter. The 4-year-old loved "Mickey Mouse" and "Dora the Explorer," relatives said. Hawkins Scott is due back in court April 7. My deepest condolences to the family and friends, who are still grieving the loss of Mya Renee Migneault. After reading this post; I couldn’t help but think how senseless this wicked act was! Please know, that in God’s due time “The wicked will be no more” as Psalms 37:10 &11 brings out “And the last enemy, death, is to be brought to nothing.” 1 Corinthian 15:26. Again my deepest condolences and I will keep you all in my prayers. — De Sept. 11, 2016 at 11:51 a.m.
— Loss for words Oct. 16, 2015 at 7:57 p.m.
What is wrong with people? There's too much evil in the world,such a beautiful child of GOD. — Tim Feb. 18, 2015 at 3:27 a.m.
— Loving Peace Sept. 26, 2014 at 6:03 p.m. Nothing to add. Just an adorable lil girl. please RIP Sugar! — Major April 8, 2014 at 4:37 a.m.
— Concerned Citizen April 4, 2014 at 10:01 a.m. I hope the killer never sees the light of day over this. So sad. — hardworkingwoman April 2, 2014 at 7:10 a.m.